This program has NOTHING to do with magic. It has to do with the thrilling power of classical music! I wish I had had this program in college. In Music Appreciation and Music Literature we had to listen to musical compositions for hours in the library and be prepared to pass a "drop test." (That was the "olden days" when we still had records). We had to identify the composition and its composer just from the tiny bit the professor would play when he dropped the needle on the record! This program would have be an invaluable resource to me, even in college! Your kids will be able to do it effortlessly when they learn the themes to these clever songs. Classical Magic® is a truly unique classical music program. It begins with Pre-K and may be used through high school and beyond. 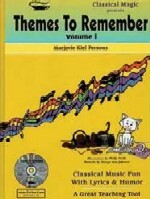 The author, Marjorie Kiel Persons, has written light-hearted, educational lyrics to 127 of the world’s most beautiful classical music themes. When children sing the lyrics, they automatically learn both composer and composition. The music becomes their own! The best part is that music and words together go into long-term memory so children can have a lifetime adventure with classical music. They will never forget or outgrow classical music. Each theme has two CD tracks – one with music only and one with music and lyrics. This format is designed for "Name that Tune" games. 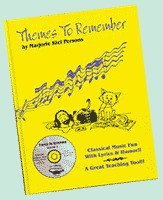 Most themes take less than a minute to sing making it easy to include classical music in your daily program. You need no previous music training to use the program successfully. The most important thing is to have FUN. Learn the themes quickly and play games. A love for classical music is one of the most important gifts you can give your child. All books are organized by musical period – Baroque, Classical, Romantic and Modern. Piano (a kitty) and Forte (a dog) frolic through the books and introduce each Period dressed in the clothing of that Period. (Piano means "soft" and Forte means "loud" -- dogs are louder the cats!) Books are not organized by grade level, although Volume 1 Teacher’s Guide has a Suggested Order of Learning. Rather than proceeding from front to back of the books, choose the selections that fit with the mood or material you are teaching – or just have fun with selections you love. Written in a hurry for his mother’s string quintet. We saw a giant rainbow trout. * and Sousa’s Stars and Stripes Forever. Teacher’s Guides are available. These guides emphasize the importance of introducing children to, and generating enthusiasm for, classical music by first building a theme recognition foundation. 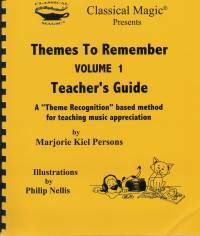 The guides then give proposals for using each of the 40 classical music themes in each volume to introduce the relevant music concepts and the appropriate National Music Teaching Standards. This curriculum material is adaptable to any age group.